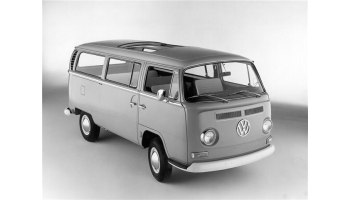 The Volkswagen Type 2, officially known as the Transporter or informally as Bus (US) or Camper (UK), was a panel van introduced in 1950 by German automaker Volkswagen as its second car model – following and initially deriving from Volkswagen's first model, the Type 1 (Beetle), it was given the factory designation Type 2. As one of the forerunners of the modern cargo and passenger vans, the Type 2 gave rise to competitors in the United States and Europe, including the Ford Econoline, the Dodge A100, and the Corvair 95 Corvan, the latter adopting the Type 2's rear-engine configuration. European competition included the Renault Estafette and the Ford Transit. As of January 2010, updated versions of the Type 2 remain in production in international markets— as a passenger van, as a cargo van, and as a pickup truck. Like the Beetle, the van has received numerous nicknames worldwide, including the "microbus", "minibus", "kombi" and, due to its popularity during the counterculture movement of the 1960s, "hippie van". Type 2 Bus Front End Adjuster (Pair) produced to a very high standard. ..
Vintage Sun Canopy with original quality gutter mounts as per the original westfalia product meas..
Our new cab window Mosquito Nets are attached without the need to drill holes and fit poppers! &n.. Type 4 Engine Fan Housing Front Grill produced to a very high standard. .. Type 2 Baywindow Stainless Steel Gear Shift extension produced to a very high standard. .. Type 2 Baywindow Stainless Steel VW Emblem 249mm produced to a very high standard. .. Type 2 3 bow polished stainless roof rack for your bus. Comes complete with all fittings requ..
Superbly constructed light weight aluminium mesh sunvisor to fit all Type 2 Baywindow vans from &.. Type 2 Splitscreen Stainless Steel Pop Out Hinge produced to a very high standard. .. Type 2 2 bow polished stainless roof rack for your bus. Comes complete with all fittings requ..
Our high quality Children's Cab Bunk comprises of a strong brown canvas, 2 adjustable po.. Type 2 Splitscreen Stainless Steel Gear Shift extension produced to a very high standard. .. Type 2 Splitscreen Stainless Steel Pop Out Hinge Spacer produced to a very high standard. ..